TAMPA, Fla. – The Red Wings will play the biggest game of the year without their biggest weapon on the back end. 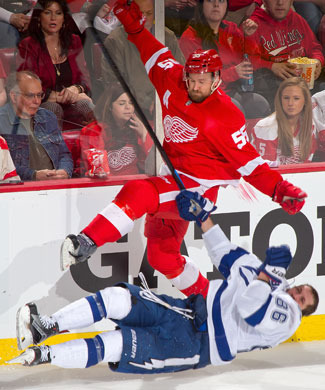 Defenseman Niklas Kronwall has been suspended for one game for his illegal hit Monday night to the head of Tampa Bay forward Nikita Kucherov. It’s a devastating blow to the Red Wings who are now faced with playing Game 7 without their top defenseman. Kronwall has two assists in the series against the Lightning. “What I do in life is I worry about things that I can control,” coach Mike Babcock said. Kronwall, who has never been disciplined by the league in the past, had a telephone hearing Tuesday with the NHL department of player safety for the hit during Game 6 of the Eastern Conference first-round series at Joe Louis Arena on Monday. The hearing stemmed from the hit on Kucherov with one minute remaining in the second period. The 21-year-old was flattened by the hit inside the Lightning blue line. As the Tampa Bay forward made a pass from along the right half wall, Kronwall pinched in before delivering a jarring, back-first hit, his left forearm making significant contact with Kucherov’s face. The hit looked worse than it was, knocking the helmet off Kucherov’s head. No penalty was assessed by referees Steve Kozari or Dave Jackson, and Kucherov, though he looked initially dazed, remained in the game. It’s a stiff price to pay in Game 7 of a playoff series, especially for a player of Kronwall’s temperament, not to mention his importance to the team. The Wings will either use rookie Alexey Marchenko or veteran Jakub Kindl in Game 7. Marchenko appeared in the first two games of the series. Kindl hasn’t played yet. It’s believed that Washington's Donald Brashear was the last NHL player suspended for a Game 7 for what the league called a "blind-side hit" on New York Rangers center Blair Betts in Game 6 of a first-round playoff series in 2009. Toronto's Shayne Corson missed a Game 7 in a 2002 for kicking New York Islanders defenseman Eric Cairns at the end of a fight. The last Wing suspended in the playoffs was Justin Abdelkader, who sat out Game 4 and 5 against Anaheim for his illegal hit to the head of Ducks defenseman Toni Lydman in 2013. Kronwall has thrown a lot of these hits without as little as a hearing, let alone a suspension, in his 11 NHL seasons. He has a reputation as a hard hitter, but a clean player, which is why the Wings were surprised by the news of his suspension. Kronwall’s hit certainly isn’t the only controversial one to come out of this first-round series. Jason Garrison left Abdelkader crumpled along the end boards with a hit to the head in Game 5, and Ondrej Palat clobbered Luke Glendening in the head behind the Lightning net midway through the first period in Game 6. Neither Tampa player was penalized. Kronwall’s streak of 98 consecutive playoff games will come to an end Wednesday. The last time Kronwall missed a playoff game was in 2007 when he missed the entire postseason with a broke sacrum.